HostPoint Review 2019: Is HostPoint a Good Hosting? Hostpoint offers some serious bang for your buck with advanced features you don't find in most places. Their bank-certified data centers are an excellent choice for those looking for both speed and security from their hosting company. 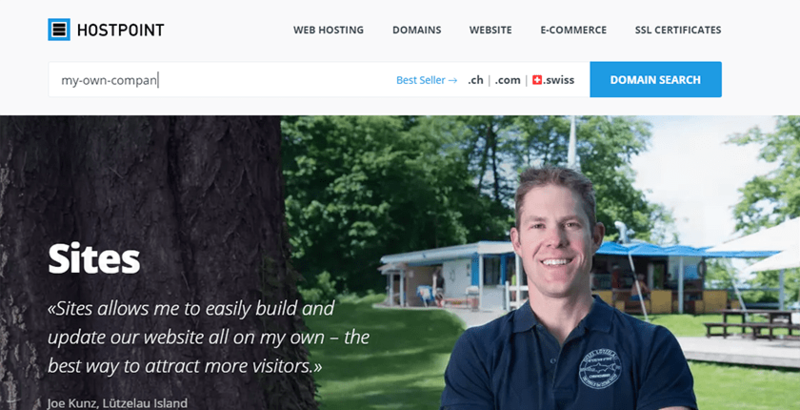 Hostpoint is a Switzerland-based company with over 17 years of experience and has hosted over 500,000 domains during that period. They host state-of-the-art equipment in bank-certified data centers, meaning they are among the safest webhosts you can find. They offer fantastic value-added services, making them as basic or as robust a provider as you need them to be. Yes, you read that right, you get SSL certificates for ALL domains hosted, not just a single domain like from most hosts. That can save you hundreds or even thousands if you host a large number of domains. While Hostpoint doesn’t offer a drag and drop website installer, they do offer one-click CMS installation for a large number of applications including WordPress, Joomla, and others. This makes Hostpoint an excellent choice for those less technically inclined. The service is also robust enough to meet the needs of advanced webmasters including allowing for command line server work. The good news here is that you get a ton of space if you’re hosting just a couple of sites. However, if you max out the number of domains you can host, that only averages out to 5 GB per site. I’d really like to see unlimited hosting here. With that said, Hostpoint clarifies that your email storage does not count towards your website’s data storage. That’s a big plus if you happen to store a ton of emails. One thing I am not impressed with is the data backup policy. Thirty days to six months sounds good, but it’s not all that great if you host a webstore or databases that require you go back more than six months. If you have long-term database needs, this host won’t work for you. Customer support for Hostpoint is more than adequate but lacking in areas. Their only 24/7 support is email. Their phone support is only available from 9 am to 6 pm U.K. time, and they don’t offer a toll-free option for international callers. Also, their live chat support is via Skype rather than live chat on the site. This is very disappointing as many people don’t use Skype and they will be forced to install it to chat. They do have a reasonably robust support center with a large number of support tutorials available on all products. There are two things that I do like about their support. First, they offer Remote Support so they can connect to your computer and see what you’re experiencing and even take over and fix problems for you. Next, they have agents who can speak English, German, French, and Italian. Hostpoint offers an impressive array of features that allow you to create anything from a simple blogging site to a network of webstores. While some characteristics can be improved, such as storage backup retention, they should still be a great fit for most websites. Wondering how HostPoint stacks up against other Web Hosting companies? Enter any other Web Hosting company and we will give you a side-by-side comparison.